prepare for the upcoming holidays. Our leftover outdoor plants are GONE. Our benches are fully stocked with all sorts of evergreens, large and small, perfect for filling your porch pots and windowboxes. The outdoor bulbs have been banished to the fertilizer shed to make room in the shop for tons of houseplants, gifts, and arrangements. The outdoor bulbs (including garlic) are now 30% off. You can continue to pop them in until the ground freezes. Our shipping and receiving porch is overflowing as we try to instantaneously transform our retail shop and greenhouse for this exciting time of year. We will be making Thanksgiving arrangements for the next 8 days. Either stop by and pick one up or call ahead and place an order. I spent all of Sunday outdoors, happy to see the sunshine, layered up for the cold temps. I planted EVERYTHING I had taken home over the past few months- 60 plants! I couldn’t believe how many plants I added to my gardens. I was exhausted but very pleased with myself. All that’s left to put in is my garlic and my spring blooming bulbs. I emptied my clay pots and stored them in the garage. I cut back the frozen plants in my clay-like plastic pots and started studding them with some greens and berries. 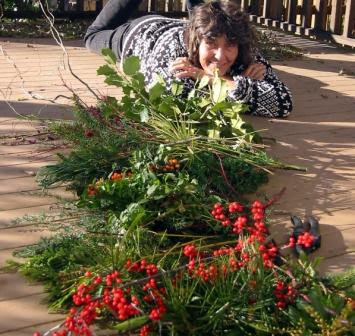 I pulled a giant pile of fresh grapevines for making wreaths and garlands. 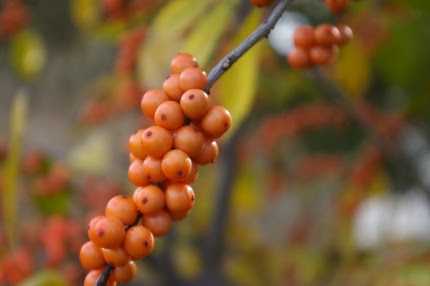 I will be bringing in my orange winterberries this week to start making Thanksgiving arrangements. came over and we harvested together. She took this photo of me on my deck. My evergreens have nearly doubled in size since this photo and I have continued to add more varieties. This is also an excellent year for my red and orange winterberries as they love the rain. 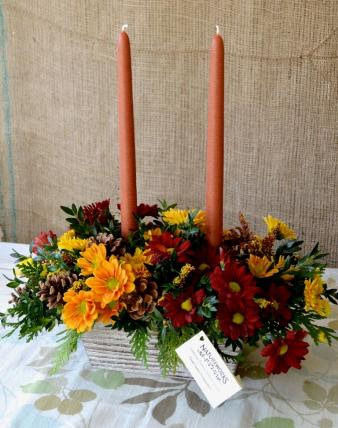 I will be bringing in my orange winterberries this week to start making our Thanksgiving arrangements. I also harvest orange ‘Flame’ willow branches. We love to decorate with natural materials harvested locally and we LOVE to design with unusual materials. 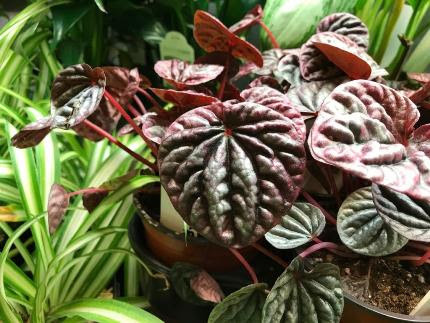 Spray your plants with WiltPruf NOW. Don’t forget to grab a few bags of Coast of Maine compost and hill up your rosesbefore the compost freezes. This offers excellent protection against the ups and downs of the thermometer in our crazy winters. 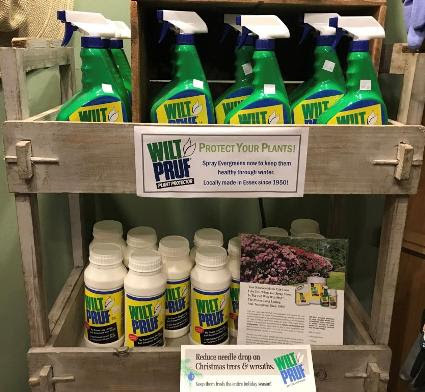 We are fully stocked with WiltPruf, our favorite, CT made, all natural anti-desiccant spray. Both of these forms of winter protection for your gardens and evergreens were described in last week’s email. If you are like me, you are still deep in the throes of cutting back your gardens. If you need detailed information, Click Here and read the long version of Putting your Garden to Bed. It is stuffed full of excellent information. all of the ornaments that they have chosen for our Christmas shop this year. We specialize in nature-themed ornaments and this year, we have so many super-cute fuzzy goats, sheep, mice, dogs, kitty cats, and so much more! 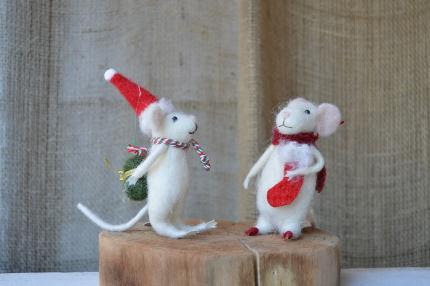 If you want to watch a video featuring one of our ornaments, Click Here. If you liked that, watch This One ! Yes, we are having a ton of fun this year! That’s what it’s about at Natureworks. 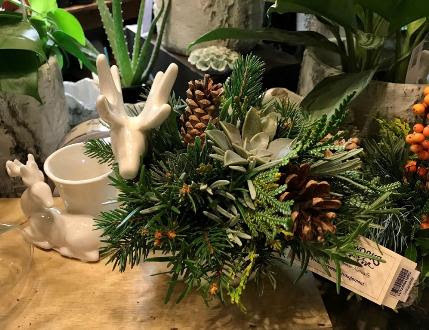 Beautiful, inspiring, natural arrangements, gifts that make you happy, houseplants to brighten your mood all winter long, and tons of beautiful bulbs to plant and grow and give as gifts. Creativity abounds. 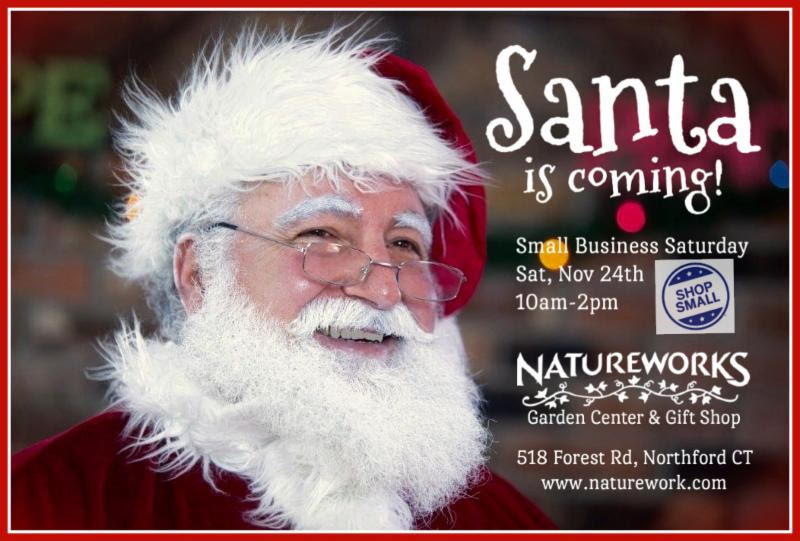 We have only just begun- wait until you see how amazing Natureworks will look by the time Santa arrives on Small Business Saturday! We will even have our first shipment of gorgeous, CT grown, fresh cut Fraser firs in by that weekend. 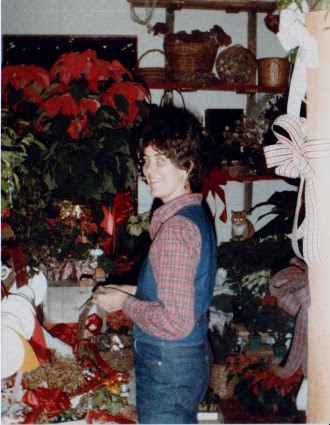 The first weekend in December is our 35th annual Christmas Open House. 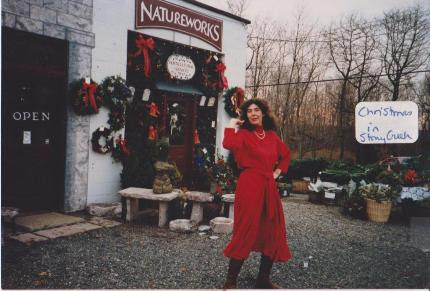 From the very first days of Natureworks in Stony Creek back in the 80’s, we have been celebrating with hot mulled cider, cookies, and festive greenery of every shape, size, and description. Don’t miss this celebration! Here are a couple of shots from the early days to make you smile! If you focus your attention on shopping small, shopping local, and supporting the hardworking folks in your community that offer so much diversity and creativity, this time of year can be a joy to experience. For us, it’s personal. Everything we select for our shop, every thing we make and design, is with you in mind. The same customers have been coming back year after year to celebrate with us. 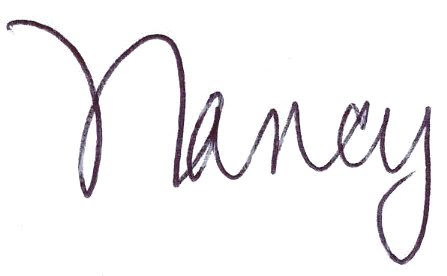 We love what we do and are so grateful that you support us and enable us to keep on growing. 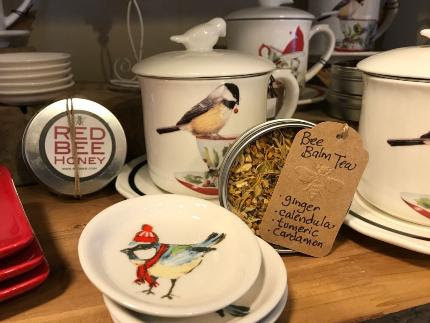 Wonderful CT made Red Bee honey is back along with their new healing Bee Balm Tea blend. Check out the herbs- ideal for this time of year. Stop in this week and see what’s new. See you soon!